It's that time of year when the wind is cold and the snow might blow. A time when getting outside isn't always an option, and the kids might get a little whinny. What's a mom to do? We love playing games at our house, but even the most enjoyable games can get boring after awhile. This month I've had a few new games and we're really enjoying them. So much I thought I'd share them with you. One thing I love about them is most of them have an educational purpose that doesn't distract the kids from enjoying them. First up is the Scrambled States of America. It's based on a book and is a hoot! It's also a wonderful way to help your kids learn the geography of the United States. Where states are in relation to each other and matching states and capitals together. Our two youngest really can't play it-- we get a little fast and furious as we go, but the 9 and 12 y.o.s have no trouble with it. Very fun, fast-paced, and educational. Next up is a game for the small fry. 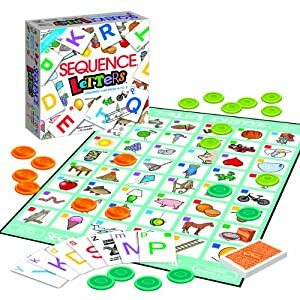 Sequence has long been a family favorite as has Sequence for Kids (matching animals). For Christmas our 4 year old received Sequence Letters and it is a great way to match letters and sounds. It takes around 10 minutes as you match letters to the pictures that start with the sound. Our four y.o. has no trouble playing it and the 2 y.o. can jump in, too. In fact he learned the phrase "I win" while trouncing us all over Christmas. Another game we are really enjoying is Too Many Monkeys. Another game from GameWright, it is designed for six and up, but our 4 y.o. has not trouble with it, and the 2 y.o. basically has it down. Monkeys are coming to a slumber party, and they need to get in order from 1 to 6. Elephants and Giraffes aren't welcome, but orangoutangs serve as the wilds. It is fast-paced as you race to flip your cards and get them in the right order, so it's another you can play several rounds of in a short time. Very fun and great when you only have a few minutes or need to distract some kiddos. 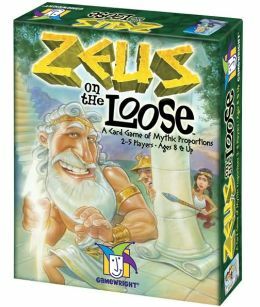 The final game we are really enjoying is Zeus on the Loose. This is a FANTASTIC game for helping kids learn to add quickly from 1 to 100. The number cards are from 1 to 10 and you slap them down quickly in an attempt to keep Zeus. With each round if you win, you get one letter in Zeus' name. The first person to win four rounds and spell Z-E-U-S wins. Several of the Greek gods are mixed in like Poisiden, Ares, and Aphrodite, but any learning about them happens outside the game. Great way to help kids learn to add 23+8, 37+9, etc., quickly. Add to these Rat-A-Tat-Cat and Sleeping Queens (games we replaced because we've worn them out) and you know what we're doing at our house. What games do you like? We also enjoy playing games. I'll have to check out the games you just mentioned, they sound like a good fit with the games we play. We like Scrabble, Sorry, Apples to Apples, Quirkle, Rage, and Uno to name a few. We love Uno and Apples to Apples. My husband loves playing Sorry with the kids. I'll have to chek out Quirkle and Rage. Never heard of them! Thanks, Tammi!